Family engagement is not optional. It is not an idea that can sit on a shelf until we determine we have the time or interest. In this blog series, to date, I have expressed my own strongly held beliefs on schools and families working together for the good of the child/student. I have laid bare the theoretical underpinnings that inform my own core values and attachment to community and social justice. I believe we (school leaders) need to better recognise and embrace the concept of communal leadership and community capacity building. 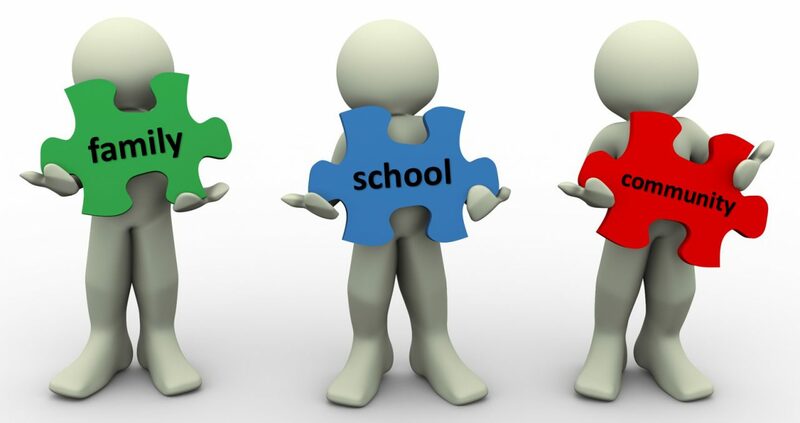 Currently, there is much in the news and on social media in the UK that suggests too many schools are acting in a way that is alienating them from families and local community. Although, I am aware that far far more are working tirelessly to achieve the polar opposite. The actions of the former does beg the question, Why? I sincerely hope that if you were to analyse key policy documents in any school in the UK (World?) you would detect the child/student being the central figure. Wordle your school documents and find out? Look up ‘child-centred’ in the Oxford English Dictionary and you will get ‘Giving priority to the interests and needs of children’. Dr. Joyce Epstein’s overlapping spheres of influence model places the child/student plum in the middle. The spheres of influence being: school, family, and community. I will return to Epstein’s model, below. Dr. Steve Constantino once said to me: If we [schools and educators] truly had it all worked out so that all children were achieving in our schools, without the need to engage with families, then good. But we have not, and will not, so we must. I am paraphrasing there, Steve, but that was the essence of your message. I make no secret of the fact I am a big fan of Steve’s work and, quite literally, logic, so far as family engagement is concerned. That, because Steve’s work talks of and seeks depth of engagement; something recognised by Peter de Witt in his foreword to Steve’s book Engage Every Family: Five Simple Principles. Tellingly, Chapter 1 in that book is titled Would Every Family Choose You? What better starting point? If we cannot trust ourselves to check back in with that on a regular basis should we consider emblazoning it big and bold somewhere on the walls of our staff rooms and offices? Steve tells the story of Yagottawana. He uses the story to stress that if one’s desire to make a difficult change (or choice or decision) does not start with the very simple notion that the change (choice, decision) is something we desire, then the likelihood of success isn’t very high. Having numerous issues and stressors in his life, a gentleman made the difficult decision to seek professional counselling. This was a decision that did not come lightly and one that the man debated and rejected many, many times. In the final analysis, though, the man realised that without some assistance, the issues in his life would continue to affect his health and his relationships with the ones he loved. Because of this, he took the large, difficult, and scary step to take help. Upon arrival to the counsellor’s office, the gentleman was immediately put at ease. He was under no obligation to say anything he didn’t want to say or take any action he didn’t want to take. He was in complete control of the conversation. Almost without knowing it, an hour went by, and the gentleman was asked if he would return the following week. He agreed. The following week (and several weeks after that) seemed to be a repeat of the first. He talked about all kinds of things, and the individual hours of conversation flew by. After several weeks, he realised he felt a bit better but really couldn’t put his finger on why. At his next appointment with the counsellor he decided to ask. He walked into the meeting, sat down, and asked the counsellor the question he had been pondering. “You feel better because you have discovered the secret,” the counsellor said. “The secret? The secret to what?” The gentleman was a bit irritated at the answer given to him. “The secret to success,” answered the counsellor. He walked over to his desk and picked up what looked to be a picture frame and handed it to the gentleman. “Please read this out loud if you will,” said the counsellor. The gentleman looked at the frame. Inside the frame there was no picture and really no sentence or recognisable word to read. He simply saw the following. When the gentleman read it out loud, at that instant, he realised what the word was and what it meant. “One’s personal desire to make a difficult change starts with the very simple idea that we WANT to make the change. Without the intrinsic desire, whatever our goal, it most likely will remain elusive. You have decided to make the change. Therefore, you are.” The counsellor sat back waiting for a response. “That simple.” The counsellor smiled and said not another word. Neither did the gentleman. The following extract is drawn from a research project carried out in the UK by Harris, Andrew-Power and Goodall, reported in Harris et al. (2009) that explored the relationship between parental engagement and pupil achievement. Parental engagement seems to be the worst problem and the best solution. It is the worst problem because it can be difficult to secure, and it is the best solution in terms of raising student performance. The research ﬁndings highlight a number of barriers facing certain parents in supporting their children’s learning. The authors argue that powerful social and economic factors still prevent many parents from fully engaging in schooling. Furthermore, that schools rather than parents are often ‘hard to reach’. Professor Alma Harris and Dr Janet Goodall’s work is grounded in an extensive and impressive body of research in the real world. And so, it is with real authority that they warn of the need for major efforts by schools to understand the local community, and that deep engagement is only possible if the relationship is perceived to be genuinely two-way (Harris et al. 2007). The evidence is convincing; families have a major influence on children’s achievement in school and through life. When schools, families and community groups work together to support learning, children tend to do better in school, stay in school longer, and like school more. Dr. Joyce Epstein is the architect of the ‘Six Types of Family Involvement’. Again, I return to the idea of depth. Take a look. Stop! Do not read Beyond the Bake Sale unless you are willing to take a hard look at your beliefs and attitudes about home-school relationships and parent involvement. Epstein developed her theory of overlapping spheres of influence, positing that students learn more when parents, educators, and others in the community work together to guide and support student learning and development. In this model, three contexts – home, school, and community – overlap with unique and combined influences on children through the interactions of parents, educators, community partners, and students across contexts. With attention to contexts and social relations, the theory of overlapping spheres of influence changes the narrow focus of “parental involvement” from what an individual parent does to a broader, more realistic representation of how students move, continuously, in and out of several contexts and how the influential people in those contexts may work together to contribute to students’ education and development. The logic works, and it worked, for me. Not forgetting (Chapter 2) that it is the responsibility of all in school, and leaders have a responsibility to provide top quality professional development opportunities around family and community engagement, plus the time to immerse themselves in active participation, alongside parents/carers and community members. Parents’ voices must be heard when it comes to decision making at the school. This enables families to participate in decisions about the school’s programs and activities that will impact their own and other children’s educational experiences. All parents must be given opportunities to offer ideas and suggestions on ways to improve their schools. Having families as true stakeholders in the school creates feelings of ownership of the school’s programs and activities. I offer no apologies for laying down chunks of referenced text in this blog, although I do appreciate they amount to much. I do thank Steve and those who have dedicated themselves to enabling schools to embrace the power inherent to a recognition of the overlapping spheres, namely: School, Family, and Community – with the child/student front and centre. We are spending a great deal of time, energy, and resources on learning all we can about twenty-first century instruction. We spend millions of professional development dollars searching for those ideas that will bring us success with every student – a success that still eludes us. In all of this, the notion of family engagement, that being empowering the first and most influential teachers of children, seems to somehow get lost. We simply cannot let that to continue to happen. Constantino, S. (2016) Engage Every Family: Five Simple Principles, Thousand Oaks, CA: Corwin. Harris, A. and Goodall, J. (2007) Engaging Parents in Raising Achievement: Do Parents Know They Matter? Warwick: University of Warwick. Harris, A., Andrew-Power, K. and Goodall, J. (2009) Do Parents Know They Matter? Raising achievement through parental engagement, London: Continuum. Henderson, A. and Mapp, K. (2002) A New Wave of Evidence: The Impact of School, Family and Community Connections on Student Achievement000, Austin, TX: Southwest Educational Development Laboratory. Henderson, A.T., Mapp, K. L., Johnson, V.R. and Davies, D. (2007) Beyond the Bake Sale: The Essential Guide to Family/School Partnerships, New York: The New Press. First and foremost, thank you. While I am honored that my work has resonated so well, I am more deeply appreciative of the true passion and commitment that comes from your words. When we as educators take the initiative to truly engage with every family (not just the easy ones!) our children are simply better for it. It is also important that you as a practitioner have picked up the gauntlet. We need more voices like yours in this important discussion. I continue to trudge away at this in hopes that we are garnering a critical mass, Gladwell’s “Tipping Point,” toward sustaining the engagement of families in education as a main driver of educational reform and improvement. Your’s is another voice added to the list. Thank you. Thank you for your feedback, Steve. You are respected and listened to because you say it as it is and get straight to the nub. Worth repeating because that simple statement says it all.